Domestic stock mutual fund is typically the main investment fund for every investor. Rule of thumb is to have about 20%-50% of total assets in this domestic stock fund. This fund can be used as asset portfolio diversification. 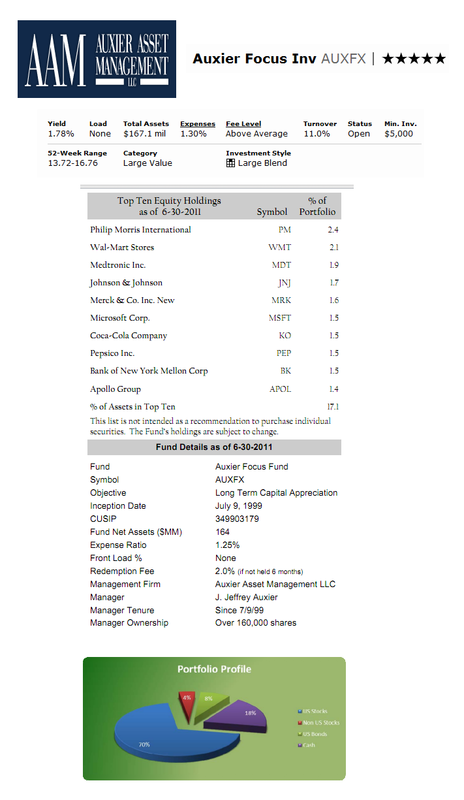 One of this best fund review is Auxier Focus fund. The Auxier Focus Investor Class fund’s objective is to provide long-term capital appreciation. This Auxier fund invests mostly in the common stock of medium to large U.S. companies. The invested companies usually have >$1 billion market capitalization. It may invest <25% of net assets in lower-rated securities or unrated. This large value stock fund also may invest <25% of net assets in fixed-income securities issued or guaranteed by the U.S. government, or by the Canadian government and their governmental agencies. It may invest <20% of net assets in foreign securities such as American Depositary Receipts (ADR). J. Jeffrey Auxier has been the lead fund's manager of this large value fund since it was introduced to public in July 1999. The expense ratio of this fund is 1.30% per year which is slightly higher than the average in the Large Value category (1.27%). It shares 1.78% yield. This fund uses S&P 500 as the fund’s benchmarks. This top rated domestic stock fund is a no load fund, meaning it has no front-end sales load fee or deferred sales load fee. The minimum balance to invest in this best fund is $5,000 for brokerage account and $3,000 for retirement (IRA) account. This Auxier fund requires $50 for the minimum subsequent investment. This AUXFX fund can be purchased from 67 brokerages, such as JP Morgan, TD Ameritrade, Schwab Retail, Fidelity Retail Funds Network, Firstrade, Scottrade NTF, ETrade No Load Fee, E Trade Financial, Ameriprise Brokerage, RBC Wealth Management-Advisory Eligible, etc. There is no other class for this fund. This Auxier Focus fund has gotten 5-stars rating from Morningstar. US News also rated this fund as one of the best fund in large value category. It has 6.86% YTD return. Based on the load adjusted return, this fund has returned 16.98% over the past year, 6.52% over the past three years, 5.49% over the past five years and 6.22% over the past decade. The top ten equity holdings of this fund as of June 2011 are Philip Morris International (2.4%), Wal-Mart Stores (2.1%), Medtronic Inc.(1.9%), Johnson & Johnson (1.7%), Merck & Co. Inc. New (1.6%), Microsoft Corp. (1.5%), Coca-Cola Company (1.5%), Pepsico Inc. (1.5%), Bank of New York Mellon Corp (1.5%) and Apollo Group (1.4%). Investing in this domestic stock fund involve investments risks such as General Market Risk, Market Events Risk, ADR Risk, Company Risk, Equity Risk, Fixed-Income Securities Risk, Foreign Investments Risk, Growth Company Risk, High Yield Securities Risk, Large Capitalization Company Risk, Management Risk, Mid-Capitalization Company Risk, Sector Risk, Short Sale Risk, Value Company Risk, etc. More details can be found in the fund’s prospectus.